I must admit: I love the food of other cultures. I will admit that I often try to copy especially Japanese or Chinese cuisine, and typically do so badly. While the idea of a culinary “Tour of Italy” to examine the differing culinary regions of that culture intrigues me, I would love to take a tour of all the differing food regions of China. Then follow it up with a short trip through Japan, and a stopover in Korea. So, when I see ideas from an Asian cuisine that I’ve never seen, I tend to chase them down. Then, when I learn a little more, I either abandon them or try it out. Today, I am going to hit one that I tried out, and so far seem to be doing okay with: the Tamagoyaki. Now, as I titled this, I will call my work a tamagoyaki-style omelet, because it’s not completely inline with Japanese tradition. See how you have the layers? That’s the idea. 2. I take the eggs out of the pan, and preheat the pan while scrambling the eggs in a bowl. I have found that using my larger electric burner works better. It’s a 7 inch diameter burner, so there is wasted space on the sides, but it heats the whole pan evenly. 3. Into the heated pan, I put a little bit of vegetable oil. Not much! Just enough that, when heated, puts a light coating on the whole pan. You’re out to cook the eggs with pan-heat, not fry them with oil-heat. 4. Eggs are scrambled, the pan is hot, so I pour just enough egg into the pan that it covers the whole pan very thinly. Think: pour egg into one spot, then tilt pan to make the eggs run across the surface. 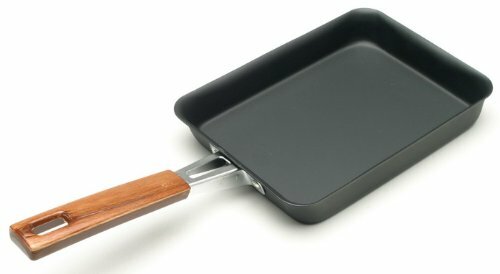 I use a silicone spatula to flatten them in well. 5. Now comes the fun part: flavor! As that first layer is getting done, salt and pepper it. Add some cheese across it if you like—or put a cheese stick at the far end of the pan (away from the handle). 6. Roll the eggs from the far end back to you. You’re creating a spiral. Then, slide the rolled-up egg to the far end. 7. Repeat the egg pour-in. Tilt the pan to get some egg under the roll at the end. As it is getting done, you can season or not season it, depending on your preference. I have done cheese in one roll, ham in the next for a ham and cheese omelet. 8. Repeat the roll and slide maneuver. I find that 3 eggs is my limit, by the way, for manageable size. That results usually in 4 pours, but sometimes 5. Frequently, I do 2 eggs and that’s 3 pours. 9. Once you’ve gotten all of your eggs cooked and rolled up, you have something that really looks like a burrito. See? 10. Let it sit in the pan, taken off the heat, for about 2 minutes. (Or time it like I do—how long does it take to pour the coffee?) Then, on to the plate for serving or the board for cutting. You can cut into multiple slices for easy eating, or just do what we do: cut it in half for perfect sharing. That’s breakfast. The taste is just different enough—and you can layer in various items if you want to. Ours are frequently just one slice of cheese to the 3 eggs, with pepper and salt. It’s quicker than it sounds—but it takes some practice. Come on over sometime and we’ll split an omelet! Now, I’ll give you what you need: a video from a professional. This is what I watched to figure out how to do this from—he uses cooking chopsticks, and I have not mastered that yet.